During those crisp months of Autumn I want pumpkin morning, noon and night. And yeah, the craving may even strike in June! This is a perfect way to use pureed pumpkin and pumpkin’s favorite spices – cinnamon, ginger and cloves. Tip: These french toast recipes call for stale bread because it’s going to be soaking up custard, but you still want the bread to hold its shape. Fresh bread will get mushy and, worst case scenario, fall apart. A 3 day old loaf should be just fine and 5 days old might be too late (make it into breadcrumbs instead.) If you have only a fresh baguette, you can cut the slices and then put them in a 300 degree oven for about 10 minutes, until they are hardened a bit but not toasted. Then proceed with the recipe. Mix together all ingredients (except for the bread, obvioulsy). Spread out baguette slices on a rimmed baking pan in a single layer. Pour on pumpkin mixture and flip to coat. Let sit for 20 minutes, then flip over and soak for 10 minutes more. Preaheat a large non-stick skillet over medium heat (I use cast iron). Spray with cooking oil, or drizzle a little into the pan, and cook about half of the soaked breads at a time for 5 to 7 minutes on one side and about 3 minutes on the other. They should be golden to medium brown and flecked with darker spots. Keep warm on a plate covered with tin foil while you cook the second batch. If not serving immediately, cover and place in a 200 degree oven for up to an hour. Serve with maple syrup and earth balance, of course. Seriously? Unbelievably good! Thank you ! 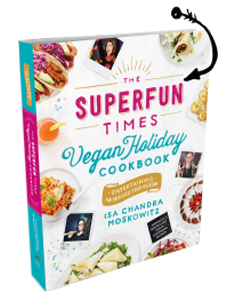 I love you and your recipes so much, I just bought the Veganomicon and Vegan Brunch and I can’t wait to make more food! My four year old at more of these than the rest of us could get our hands on, it was melt in your mouth delicious! Why do you use the cooking oil as opposed to an Earth Balance type product? Just made this and its a little plane of heaven. As a recent vegan I am happy to find recipes like this that replace old staples. Thanks! I love making vegan meals for my non-v friends and springing it on them after they’ve been floored by the taste. Made these and they wowed the audience. wow this looks delish. I love pumpkin anything though so go figure 😉 I think I might sprinkle this with coconut flakes for a little punch! just wanted to say that this is really really ridiculously good with cranberry maple syrup (take can of whole cranberry sauce, mix with maple syrup and heat)–yumm! thank you. just a question from someone who’s still rather new to cooking! what’s the point of pouring the mixture over the bread and letting it sit for half an hour? whenever i’ve made french toast (vegan & non), i’ve just dipped both sides of the bread in the mixture and put it in the pan. is that just a lazier way of making french toast? Yeah, you can do that if you’re in a pinch! But if you let is soak you get a little more flavor in the toast, and the center becomes almost creamy. Before I went vegan, my favorite go-to when I had guests was to make a baked French toast that sat in it’s batter overnight before baking (add some cinnamon sugar on top for a crunchy topping, etc.) This way everyone’s food was hot at once and it took no prep the morning of. I was wondering if you ever tried that with vegan French toast recipes, if you think that might work with something like this? I’m still so mystified by the role that eggs actually played in my baking, and where they made a difference. This looks so delicious!! Delicious! I might do a little less clove next time (my tongue is a little numb!) but other than that – so easy to make and tastes amazing! It occured to me that I love love love bread pudding, and you called the ingredients a pudding, what about a breakfast bread pudding? i am gonna make this for dinner!! Quick question. How do i properly season a cast iron skillet??? What kind of oil? How long and what temp in oven?? Wow can’t wait to try it out! Made this with cibatta and it was so good! Thanks for the recipe! I think you should add a new feature to your site where commenters can upload an image. People really like stumbling on a recipe and seeing that it is do-able. ooooh I just made this and it was AWESOME 🙂 I love the subtle sweetness and spices. I cooked mine in earth balance for a richer flavor, and of course, drizzled with maple syrup! thanks again Isa for a fantastic recipe. These look AWESOME. I wish someone would let me make these right now, but we have already eaten dinner. I will be pinning these to do later in the week. To address kae’s comment below that baguettes are not Vegan, I beg to differ. Might you be referring to brioche? Brioche uses butter and eggs. I make baguettes all the time and I never use eggs. It is an artisan bread recipe that uses just yeast, flour, water and salt in the dough. You use a steam pan in the oven to get that crispy crust. You do not need to do an egg wash. This recipe is amazing! I make it for my mom, who is allergic to eggs. She’s happy she can finaly have french toast! Thanks so much for the recipe! We have this dish every year for Christmas morning breakfast; we love it. Terrific with fresh raspberries and Stonewall Kitchen raspberry or holiday syrup. Yum!! In response to a poster: a true baguette is flour, water, yeast and salt. Nothing else. It has a shelf life of one day due to lack of preservatives. If the bread you are buying contains eggs, it is not a true French baguette and your bakery is cheating to get a longer shelf life. I worked for a very prestigious French bakery in Ft. Lauderdale, and the mere suggestion of eggs would have you thrown out the door. It’s just not authentic, and therefore, not a baguette. As always, thank you for the wonderful recipes. I enjoy them immensely. Any left over from breakfast??? (What a qeustion!!) But by a miracle – cut into small squares and serve with ‘cream or icecream’ or the new vegan jogurt later in the day. Delish!! Thank you for sharing and this magnificent site. It makes you want to cook and cook with a smile. Happy holidays to everyone. (I also trick my family and friends with these recipes and they just can’t believe it). That’s how we win them over. 🙂 love Sarah-Jane. I loooooove this recipe and the pumpkin. Cooking has still been boring but I am making the best of it. I will either be making lunch or dinner recipes in the future — I can’t decide! But I need to make a choice soon because I will be eating it tomorrow. 🙂 Maybe i will make the pumpkin french toast for my friend when I visit her — she likes squash and fall sort of recipes. I was hoping she might get to do some traveling, but since she is staying for her studies I will get the chance to see her more. Why is stale bread the method of choice? I know that french toast was started by people trying to use their stale bread but I wanted to know if and how it affects the taste. Does it make it less soggy because the bread is dry? delicious pumpkin pie, which I love! 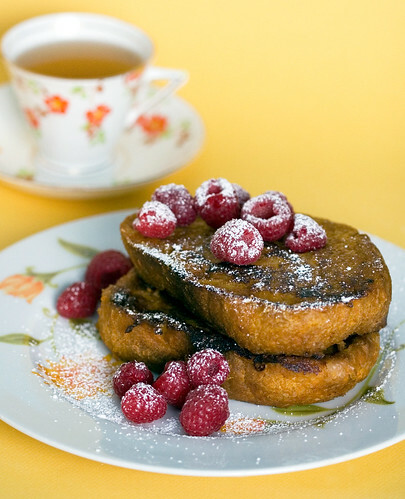 There are cakes, muffins, stews, soups, pasta dishes, and even this delicious french toast recipe. CarMax auto is the United States’ largest used-car retailer and a Fortune 500 company. TUTU app is one of the best free app stores available, be in the market which allows you to download paid games, apps, wallpapers, songs for free without any cost. Welcome to this paycheck slew cast on wellness programs and today we’re looking at a familiar mantra in the industry the claim that wellness programs are a proven way to boost employee output. Best post I’ve read. Hope to have more quality items. Hope to have more quality items. I loooooove this recipe and the pumpkin. Cooking has still been boring but I am making the best of it. I will either be making lunch or dinner recipes in the future — I can’t decide! But I need to make a choice soon because I will be eating it tomorrow. Tutuapp is a unique app store because which feature is given by this app. You’ll not get anywhere in another app store. This is the mkst interesting application which fulfilled users demands in a seconds and gives best results to them. When everyone is finding such a best app store against play store then Tutuapp is the righy choice for all of you. The themes and design of this app store is mind blowing becauae the graphics user by developer are really creative. So here is the best application for you downloading best materials in a seconds and features are ultimate.